This morning when I left for the pool I had the most beautiful view of the setting moon as I drove. I could tell it was almost full, but not quite. 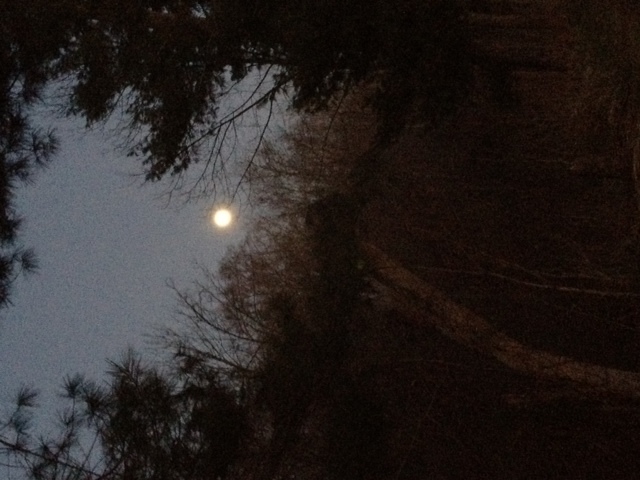 Again, as I ran this evening my path was illuminated by the moon. Fuller than this morning, yet I could tell not quite a full moon. My little research shows that is tomorrow. Many myths and superstitions have been linked to the full moon. The only affect it has on me is a great sense of peace. I have always enjoyed taking in the sight. Maybe it is working on my training, or possibly my hard work is paying off. Either way, my swim this morning was a good one. My training partner and I swam 2,500 meters in an endurance set. It was a constant pace with only 20 seconds between sendoffs except for the last 100 which was preceded by a 40 second rest. Why? The last part of the main set was a 100 all out. With 2,300 meters behind me and only this 100 meters between me and my warm down, I gave it all I had and 1 minute and 56 seconds later I pulled for my warm down. I was pleased. It was not a time trial, just a fast pace. Considering it was 4 seconds off of my fastest 100 time trial, I am encouraged that I will be under 1:50 soon. My run this evening was wonderful. This is an easy run week as I taper for the half marathon race this weekend. Tonight was an easy 4 miles on yet another very mild February evening. My pace was even and I felt comfortable all the way. The moon kept my attention the entire time. I even stopped to take a picture during the run. No worries, I stopped my Garmin too. 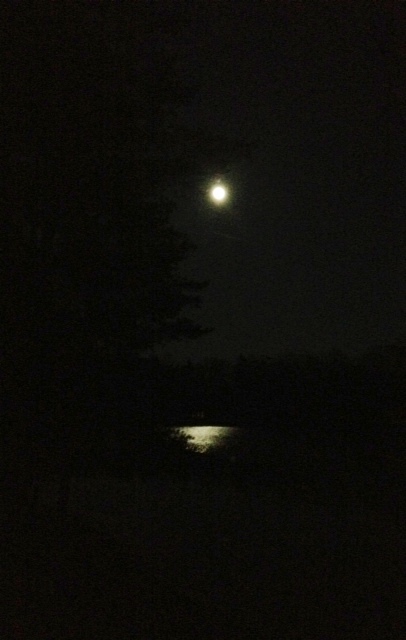 After my run I took another picture with the moon shining over the lake I live on. Both are shared below. Triathlon training takes up quite a bit of free time. In the winter, it is not surprising to see the moon more than the sun on the way to workout or during a run. But it reminds me to look up, take in all that is around me, and appreciate that I am healthy and able to spend so much time training in a sport I love so dearly. Moon from 1.70 miles into my run. Thank you! It is more of a pond, but we call it a lake. And I love it.